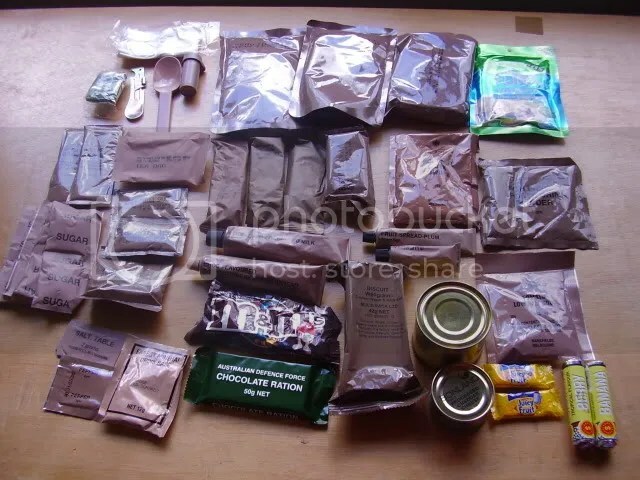 A few years ago now in a different time and place I accepted the challenge of attempting to eat just army rations for ANZAC day. I was even given real ones. The real deal. Beige packaging and all. I didn’t remember details given that it was two years ago, but thanks to the magic of online journals, I rediscovered that between Himself and I we had found it a LOT of food. With the prompt I also remembered writing “I don’t think I ever want to see jam in a tube again”. There were also some helpful hints (too little too late) from an ex-enlisted friend about how to have combined bits made it all a touch more palatable. As we headed up the Hill for our annual Easter FishBQ just 3 days ago, this challenge came back to mind, as the generous soul who proposed the challenge and provided the rations would normally have been in attendance. I asked of his whereabouts, only to be told that he was currently deployed. It’s so easy to forget while going about daily routine that the people out on the frontlines are our friends, neighbours, and family. When you wake up this morning in your comfy bed, and contemplate walking up the local café for breakfast or whatever your routine is, spare a thought for the people out there fighting for what they believe in. How many of us can honestly say the same? I have my grandfather’s 4man/1day ration tin from WW2. It would not hold much more than all the rations show above and that would be for 4 men and likely not as nutritious and potentially stale. As he died a few years ago. He was filled with bouts of fear and adrenalin whilst laying in a hospital bed and delirious. Lest we forget indeed. May our government always remember that and keep their decisions properly thought out and well presided over that the days of fighting are minimal and the days of peace many more.